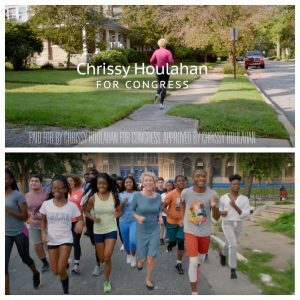 Today, Democratic candidate for Pennsylvania’s 6th Congressional District, Chrissy Houlahan released her first television ad of the general election cycle. The 30 second ad, “Service” depicts Houlahan running through different stages of her life, while detailing her upbringing and professional career leading up to her run for Congress. Houlahan continues to detail her professional career in the ad from earning a scholarship, becoming an engineer, serving in the Air Force, and several more careers leading up to her bid for public office. Houlahan is facing Republican Greg McCauley for the newly drawn 6th Congressional District open seat. Rep. Ryan Costello (R-Chester) announced he was not seeking reelection in May. The newly drawn boundaries for the district went to Sec. Hillary Clinton in 2016 by nearly 10 points. The McCauley campaign finds the ad to be disingenuous. The Houlahan campaign previously disputed the wage claim, saying a report on the subject focused more on a neighboring factory than the one operated by her company. If you see this ad or any political ad, I invited you to flag it for me at John@PoliticsPA.com. If you want to create a new more morally upstanding congress, then DO NOT vote for Chrissy Hooligan in November. Right, they were too busy making Ivanka’s failed clothing line. Oh well. Ivanka is just as bad! And you agreeing that Ivanka is wrong means that you agree that Chrissy is wrong too! They’re both wrong, you just agree with the Socialist here because all liberals have a blinding political bias LOL. Guess that backfired huh? Where did I say I supported Chrissy? I hate hypocrites regardless of party. Know the difference between Made in China and Chinese Sweatshops. Houlahan used CHILD LABOR!Ages 6 to 14! I think the R’s miss the point criticizing this ad. Chrissy Houlahan is framing who she is in a 30 second spot. It’s upbeat and stands as a mission statement for what she represents. It’s good. This ad hits the spot with it’s positive message..
She has nothing to offer. Zero solutions.